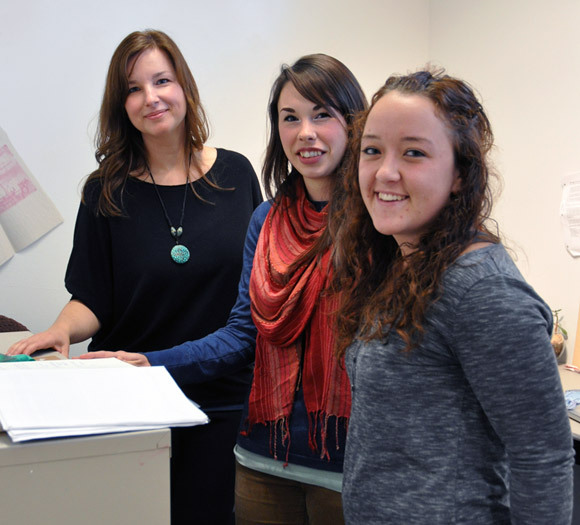 UBC’s Michelle Lowton, (left), chats with students Kelsie Balehowsky and Jenna Gall. Both students have organized community events with assistance from UBC’s Tuum Est Student Initiative Fund. As a fourth-year Earth and Environmental Sciences student, Jenna Gall has plenty of great, far-reaching ideas that spread well beyond the classroom. While taking the Geography of Food Systems course in the Irving K. Barber School of Arts and Sciences at UBC’s Okanagan campus last spring, Gall spearheaded Food for Thought, a one-day gathering of community leaders, policy makers, farmers, politicians, land owners, and regional planners. The event was a success, attracting 70 people who came together to talk about food policy, marketing, land use, water, the Agriculture Land Reserve, urban sprawl, the wine industry, and food poverty in the Okanagan. But she couldn’t have pulled it off without a $3,500 grant from the Tuum Est Student Initiative Fund (TESIF) and the Environment and Sustainability Society. TESIF can be used to cover a number of student activities including student fees for attending specific Canadian conferences like the Model United Nations, or organizing the International Fashion show, the UBC robotics club, the concrete toboggan competition organized by students in the Faculty of Applied Science, and last year’s Fools and Feathers workshop organized by students in the Faculty of Creative and Critical Studies. “The idea is to give students a chance to connect their passion and interest with an issue on our campus or in the community,” Gall says. “TESIF can be a real assistance to some of the barriers about organizing events off campus, because they are not free. “The fund is to help people get started with an outreach project and bridge the gap between the university and the community,” says Gall. Students are encouraged to apply throughout the year, as there are rolling application deadlines. A committee of volunteers looks at each application and decides whether it meets the criteria for funding. While some of the funding can be used to cover student expenses for conferences, the fund cannot be used to cover degree, curriculum, and academic requirements, to subsidize incomes, to purchase alcohol, or for travel outside of Canada. This fund was established by the Associate Vice President of Students as a way to help students come up with ideas that promote student success, enhance student’s connection with their program and the community, and at the same time increase school spirit, says Michelle Lowton, associate director, Student Development and Advising. Lowton is often excited by the ideas forwarded by students and points to an upcoming event organized by Creative and Critical Studies student Kelsie Balehowsky. Her event, which is a TESIF-funded initiative called Art and Controversy, will bring artist Jonathan Hobin to campus for a dialogue about controversial art and the issues explored by contemporary artists. Hobin, who was recently interviewed by Jian Ghomeshi on CBC radio, will be at UBC’s Okanagan campus Monday, November 4 for a public lecture at noon, and a panel discussion at 6:30 p.m. in the University Theatre. It’s another great example, Lowton says, of the unique ideas students dream up and the importance of having funding available for them.